Having just landed in my garden three days ago, I am not responsible for the production of these blooms, Coral is. And she assures me, this is an extremely hardy orchid. Her exact words were ‘they grow in concrete’ and it WILL bloom for me next year. Ok, let me clarify that – it will grow in concrete here in the sub-tropics, other climates dictate different types of care you need to provide them with. Original photo – I couldn’t even fit it in a square. Surprise, surprise! I’ve been cropping my photos 😱 – Oh the shame, but still perfect for Becky’s ‘In the Pink’ Square in September photo challenge. 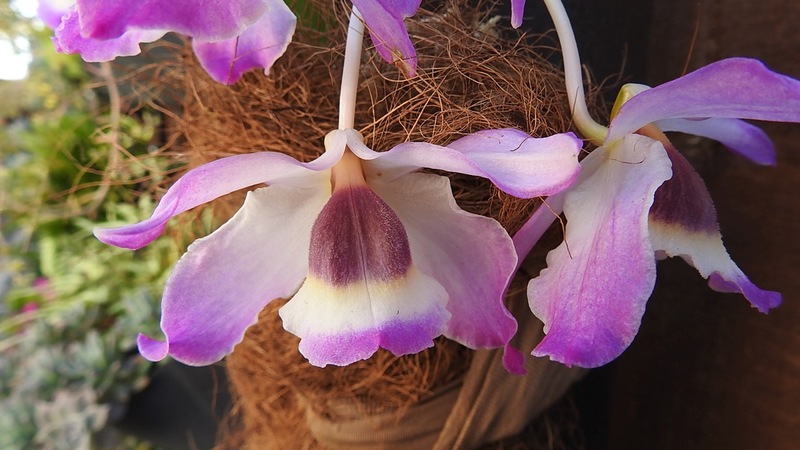 Known for its abundant, colourful, long-lasting flowers, Dendrobium nobile was not designated until 1830 and yet it quickly became (apparently) one of the most well-known of all the dendrobiums. 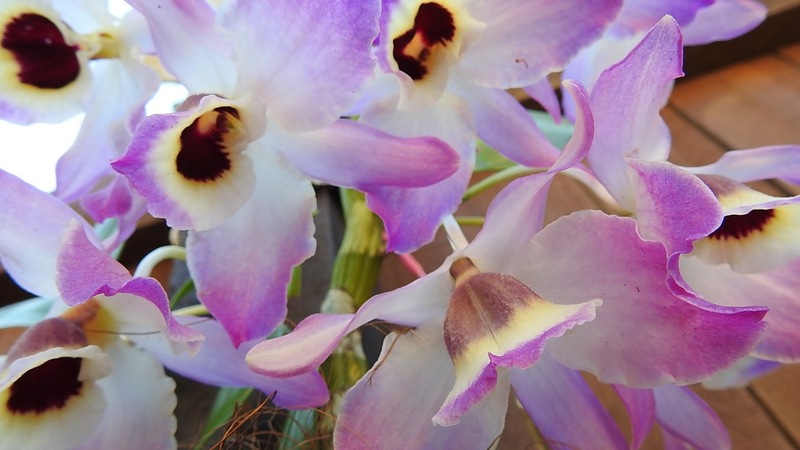 This orchid makes a wonderful ornamental plant. The leaves are bright green, strap-shaped and slightly leathery and appear alternately along almost the entire stem, but it’s those 5 – 7 cm flowers that are the big attraction (1.9 – 2.7 inches). They present in multiple clusters of two, three, or four along the stem and are waxy, very fragrant, and variegated in colour. There is something very chic today surrounding plants that present with variegation in their colours. 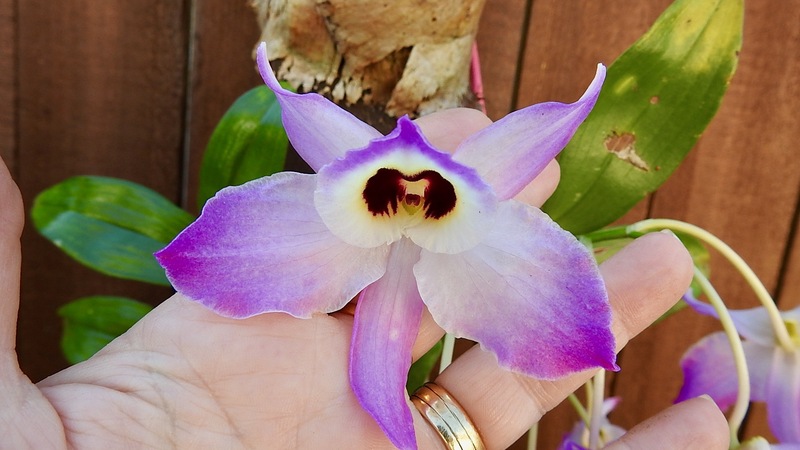 The petal of this orchid has a striking shade from white through pink and then on through to purple. Again I have to say, a colour after my own heart. Today there are many cultivated varieties that produce different coloured blooms of various sizes. Just take a look at the images a search on Google returns and you’ll see what I mean. 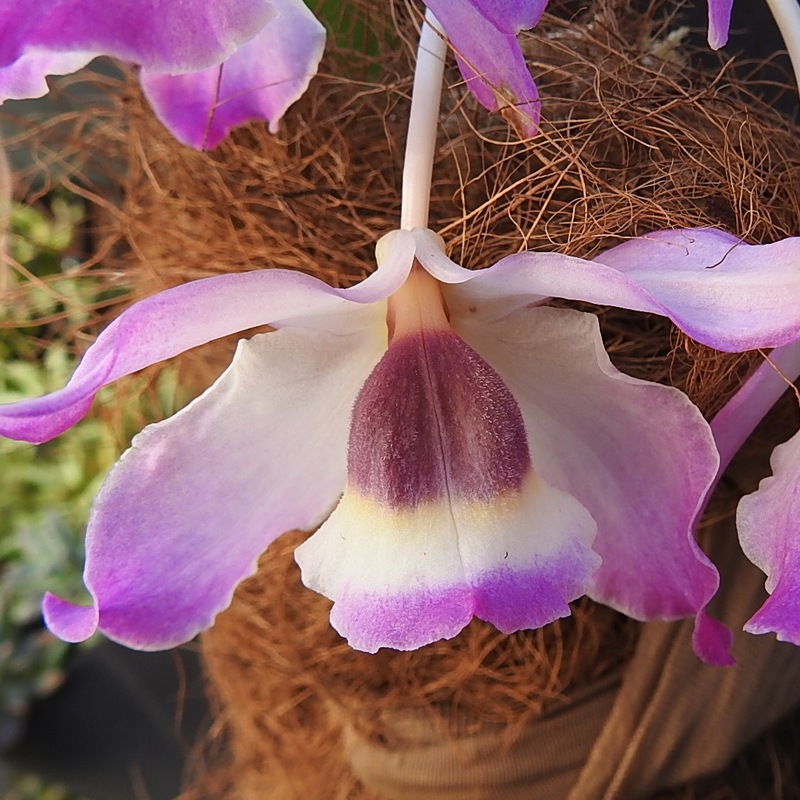 The cuttings Coral has given me contains masses of flowers and, because this orchid is an epiphyte, it will easily establish attached to the trunk of a tree. As I’ve no established tree in the garden (yet), I’ve tied it to the fence in the hopes that it will like it there. All those blooms just look delightful. I feel very spoilt right now. Look at these gorgeous colours and that centre. Coral has given me several cuttings. Besides the fence, I’ve also placed a couple of cutting in a pot and the rest of these gorgeous blooms are decorating the bench in my kitchen. I certainly feel very spoilt right now and I’ll be disappointed if I fail to have this orchid bloom next year. This is the best gift I’ve ever received for teaching someone how to use a software application. For all my friends I used to work with, I have just taught Coral how to use – CONCUR. oh I am so glad you shared the full shot of this one. Gorgeous. Sometimes the square format doesn’t always work! Thanx Becky. I agree. Sometimes I must include the whole shot. It still looks as gorgeous btw. oh how wonderful. Fingers crossed you will be sharing it with us next year too!